Imagine yourself blasting down your favorite back road, the wind in your hair, trees whizzing past you, the wail of 315hp 3.4 liter flat-6 reverberating off a canyon wall, and you have not a care in the world to be anywhere but here because you are driving the brand new Porsche Boxster S.
Porsche has completely redesigned the code “981″ Boxster the first revamp since 2004. Walking up to the car the name “Boxster” seems to fit its stance better than the previous models. Its looks more butch and aggressive rather than soft and cutesy. This is because of its 2.4 in longer wheelbase and a half inch lower stance while being squared off by a 1.6 in wider track. This means flared fenders. Walk around to the back and you’ll notice the beautifully integrated spoiler running from corner to corner right through the taillight lenses; a spoiler which rises at speed. All this adds up to an incredibly nimble car, so nimble in fact that when you approach a round-a-bout you may want to go around several times for good measure. 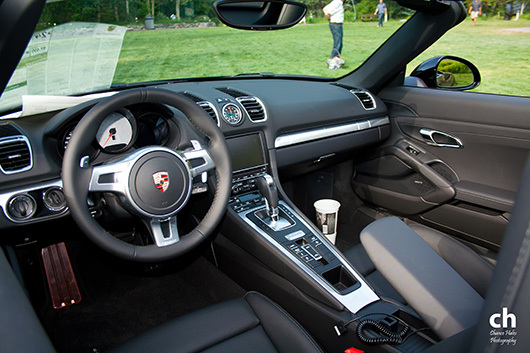 Open the door and you’ll notice the interior takes after the current Porsche design language with its high-center hull housing all the buttons from Sport and suspension settings to putting the top down surrounding the 6-speed manual or 7-speed PDK shifter then flowing up nicely to the infotainment display with the iconic Sport Chrono Package stop watch smack in the middle of the dash. The familiar 3-gauge layout is present as well only like the 911 the far right is a multi-function display used for things like navigation, tire pressure or the rest of the engine vitals. Top Gear may say the only negative to purchasing a Boxster is the fact that you are advertising your life hasn’t quite come out the way you would like however, the price tag will tell you otherwise. This S version cost just shy of $80,000. That is a mere $2000 less than the “base model” 911. The performance is near 911 too; a PDK equipped Boxster S will launch you from 0-60mph in an estimated 4.7 seconds. Compare that to the 911‘s estimate of 4.5 seconds although tests indicate 3.5 seconds is possible so expect the Boxster S to come in around 4 seconds flat. If $80k is tough to swallow then you can always opt for the “standard” Boxster which comes equipped with a 2.7 liter flat-6 producing 265hp which starts at about $50,000. Chad Waite on July 12, 2012 at 12:14 pm. That’s the first Boxster I’ve seen where I instantly thought “I want that”. Great pics man! Chance Hales on July 13, 2012 at 8:29 pm.